Nepal is the original home and birth place of Lord Shiva (who is the origin of Hatha Yoga, Mantra Yoga, Tantra Yoga, Shiva Yoga) and were all products of mutual conversations between Lord Shiva and Parvati in the lap of the Himalayas. Lord Buddha ( who is the origin of meditation) has found the true way of meditation in this Himalayas foothill. Thousands of yogis and Rishis (wise men or sages) have meditated and practiced yoga in Nepal and have attained wimisical feet since ancient times. The yogic vibrations of such great people is transcended and felt in the Everest Himalayan region. 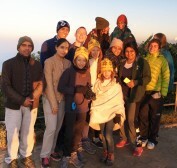 Inhale with every breath, the view of the Himalayas at dawn and practice Yoga, Pranayama and Meditation with trek. After a physically challenging and spiritual morning practice, enjoy a panoramic and healthy yogi breakfast / Lunch and many more. The Himalayan foothills are perfect destination for yoga and meditation lovers, its available all year round. If the given Yoga trek itinerary is not suitable for you, we can design a trek specifically for you. 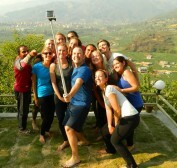 If you need more information about Yoga trek Nepal feel free to contact us. Hot and cold shower, battery recharge during yoga trek. Personal expenses phone calls, bar bills, additional porters or extra-ordinary services. Gratuities for guides, porters and driver. Any other expenses not previously mentioned. Our representative will meet you at the airport and accompany you to your hotel. Kathmandu is the historical city presents a wonderful mix of Hinduism, Tibetan Buddhism and Western influence. You’ll enjoy a guided tour to the largest Buddhist stupa in Nepal, Boudhanath. The on to the most popular Hindu shrine dedicated to Lord Shiva, Pashupatinath. We will take a tour to Patan or Lalitpur (the City of Artisans), which is 5km outside of Kathmandu. We’ll walk through Patan, Durbar Square and delight in the architectural wonders of Malla era. Mahaboudha Temple, Kumbeshwor Temple, Krishna Temple and Golden Temple are the major attractions at the square. Some of which were damaged by the Earthquake of 2015. A spectacular flight bring us to the start of our trek at the village of Lukla [2850m]. After meeting the crew and sorting out details for the long hike and the limb-crunching climb, we head up the Dudh Kosi Valley on a well-marked trail to our first camp near the river at Phakding. This is where we’ll enjoy our first over-night stay, amidst its natural wonders. From Phakding, we cross and re-cross the twisting river on high suspension bridges. Beyond Monjo is the entrance to the Sagarmatha National Park, which was developed to protect and preserve this fragile mountain environment. We then ascend quite steeply to Namche and along the way, if the weather is clear, catch our first glimpse of Mt. Everest in the distance. Namche is the main trading village in the Khumbu and has a busy Saturday market – a meeting place for the Hindu traders from the lowlands and the Tibetan yak caravans that have crossed the glaciated Nangpa La. .
Namche is tucked away between two ridges amidst the giant peaks of the Khumbu and has an abundance of lodges, tea shops and souvenir shops as well as a magnificent outlook that seems to meet western standards, even at this remote mountain outpost. The amazing Sherpa folks down here have learnt a lot from the big expeditions that have passed this way. It is an ideal place to spend a rest day, acclimatizing to the new altitude before heading off towards Tengboche. 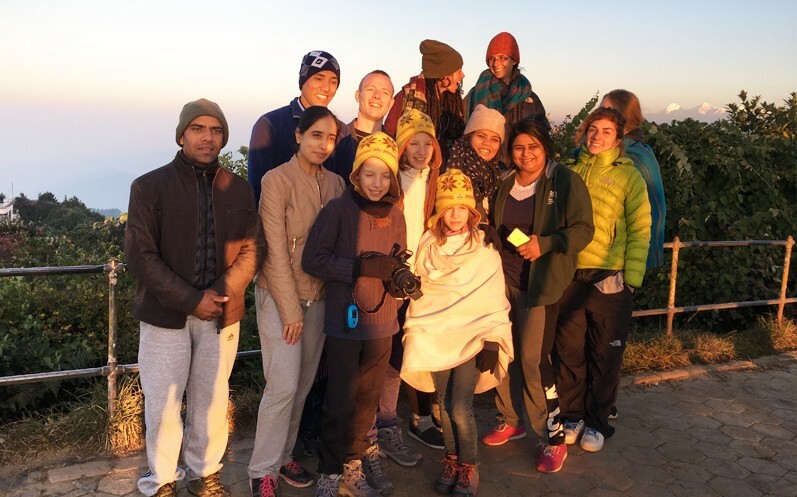 Options for acclimatization walks include a visit to Khunde hospital which was set-up by Sir Edmund Hillary, or a one hour walk up to the Everest view hotel above Namche for the sunset view of Ama Dablam, Nuptse, Lhotse and Everest. There are also good views from the national park centre and museum just above the town. We have a nice time at Namche and then settle in for the night..
From Namche the route turns west and the trail is almost level as we head up the Bhote Koshi Valley, once a popular trading route into Tibet. Along the way we pass many prayer flags and mani stones, all indicative of the Tibetan Buddhist culture of this area. After descending to the Bhote Koshi the trail climbs steeply to Thame. From here there are good views of the peaks of Teng Kangpoche and Kwangde. To the north is the Nangpa La, the pass leading to Tibet. Thame Gompa is situated above the village overlooking the valley and is the site for the spring celebrations of the Mani Rimdu festival..
We retrace our route down the Bhote Kosi Valley towards Namche and branch off to follow a quiet trail to Khumjung. It is a picturesque village which also has its own gompa at the top end of town. From our camping spot we have excellent views of Thamserku, Kantega and Ama Dablam..
Now we descend back along the valley to Phortse, a village which seems unaffected by the advent of trekkers. The quiet rhythm of life continues as it has always done in the village. .
From Phortse, passing through fields, a stream and two white Chortens, we descend along the trail to Pangboche. It takes a couple of hours to reach Pangboche. Our highest trekking point is Pangboche (3985m). Its highlight is the charming and unspoiled monastery. The monastery is believed to have been founded around 1667 which makes it the oldest Sherpa gompa in the Khumbu.. While on our way down to Tengboche we see many beautiful sights of rhododendron bushes with beautiful birds and superb mountain scenery. Tengboche is famous for its legendary monastery, the largest in the Khumbu. A spectacular panorama of Everest, Lhotse and Ama Dablam rising in the horizon can be seen from this village..
From Tengboche we descend to the bridge over the Dudh Kosi at Phunki Tenga, where there are water driven prayer wheels, before making our way back to Namche. After a breather, we settle down for the night at Namche. Our final day’s trekking follows the Dudh Kosi back down to Lukla. This last evening in the mountains is the ideal opportunity for a farewell party with the Sherpa guides and porters, where we can sample some chang (local beer – a favorite drink on the mountains), do a jig to some Sherpa dancing and reflect back on a memorable trekking experience. .